AutoCAD Subscription Price too Expensive? Try progeCAD..
AutoCAD® Alternative for the Professionals. progeCAD is the low-cost fully compatible choice for AutoCAD® DWG. CAD perpetual license at a fraction of the AutoCAD subscription price! progeCAD allows you to edit your existing AutoCAD files or draw new ones using commands, menus and icons already familiar to the user. Complete professional quality CAD drawings efficiently using our dynamic cursor, context features and batch plotting. Advanced drawing features such as data fields and tables with integrated expressional language support, annotative details, associative dimensioning and hatches are all included. progeCAD Professional 2018 is globally accepted software for a wide range of applications in CAD field & concept sketch, electrical drawing, building construction, AEC architectural, civil, structural, industrial engineering, carpentry RFI & "as con" drawings, mechanical layout, piping and cable drawing, home kitchen & bath floor plan, property survey & landscape drafting to AS/NZS1100 ANSI DIN and ISO standards. progeCAD includes options like PDF printing & 3D Printing STL export, Architectural Tools, XREF & DWG block library managers. For CAD developers, progeCAD has an AutoCAD-like command line and supports AutoLISP, Microsoft VSTA, VBA and DRX C++ programming. Enjoy the same CAD features at lower cost. Download it for free and see for yourself. Advantage Summary: Compare Software Cost and Features..
AutoLISP, VSTA, C++, COM, VBA.. Comments published** from progeCAD users over the years..
"I was so impressed with the compatibility with AutoCAD and that it did some things better than AutoCAD.. I highly recommend ProgeCAD to anyone seeking a full featured CAD program at a reasonable price. The Customer Service has also been superb!" "ABB started with progeCAD in the year 2000. ABB has distributed around 15,000 licenses..."
"progeCAD is essential ... With progeCAD, Schneider Electric can observe all market standards, guarantee DWG compatibility, and manage multisheet drawings for a low cost." "We chose progeCAD for a number of reasons. 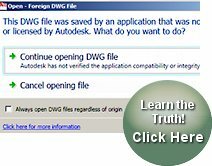 The most important were: DWG compatibility, usability, some specific features such as PDF print, and obviously the price." Others include Colgate Palmolive Australia, Nestle, Honda Motor Company, Vodafone, Siemens, Red Bull and many more. Click here to see a long list. *NOTE Some companies still maintain AutoCAD licenses and supplement them with low-cost progeCAD stations. AutoCAD is not required to run progeCAD. **Comments are published with author permission. Easy. Download progeCAD** CLICK HERE. *Note Microsoft support for Windows XP ended April 8, 2014.
progeCAD is FREE for schools. Click HERE for more details. Questions? Contacts us - CLICK HERE. We are happy to help! CADDIT.net is a preferred Australian-owned supplier of CAD Software since 2006. From the CAD News Blog..